It’s a fair question. 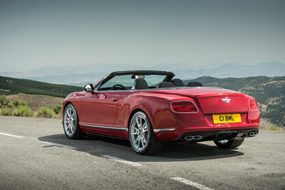 To the more casual observer the GT V8 S does indeed look little different to any other soft-top member (GTC) of Bentley’s Continental range. To those in the know, however, distinguishing a V8 S Continental from its larger 6 litre W12 brethren is easy. For starters, on the V8s, the wing badges on the boot-lid and the nose have a red background rather than the more usual black one. The oval exhausts are pinched at their middles so as to shape them like figure 8s. The biggest giveaway however is the grille. Back mesh replaces chrome. But you can almost bet some well-heeled owners will spec a shiny one, if they’re allowed to. A new, subtle, front splitter is fit to reduce front-end lift. There are sill extensions and a rear diffuser, all finished in gloss black, together with some discreet badges on the front wings. All these point out the S models. And, if the wheel-arches – as in our case – are full with seven spoke 21 inch rims the optional Mulliner pack is fitted as well. S models sit lower too, albeit by just 10mm, as a result of their stiffened suspension, firmer bushes, and revised damping. Bentley’s chassis boffins have also tweaked the steering in order to make it, they say, more responsive, more sporting, and more precise. Of course, not all of the upgrades are merely cosmetic; the engine’s also been fettled. The 4.0 litre twin-turbo now produces a 521bhp (up from an already generous 500), and a gargantuan 502 lb ft of torque that makes itself available from a somewhat relaxed 1,700rpm. Delivered to all four wheels via the Continental’s 8-speed close-ratio automatic gearbox, that heavy-hitting combination means whatever the situation, whatever the gear, the GT V8S’s performance feels effortless. Overtaking anything is contemptuously easy. The (optional) sports exhaust’s accompanying 8-cylinder-symphony, that ranges from muted American muscle-car woofle all the way up to hard-edged piston-engined fighter-plane, is, quite simply, intoxicating. You can opt for a bespoke Naim for Bentley’s digital hi-fi system. But with the GT’s four-layered roof folded back, on your favourite road on a sunny day, the tunes you can play with your right foot and the slender column mounted paddle-shifters render it virtually superfluous. Should, however, you not be in the mood for grabbing the GTC by the scruff of its neck, it’s also supremely capable of playing the long distance GT card just as well. When cruising, thanks to what’s known as cylinder de-activation, the V8 runs as a V4. The result, a near three tonne car that sips, rather than slurps, its unleaded. Granted 25.9 mpg is hardly anything to shout about. But even if your budget does stretch to a Bentley, unless you’ve also got shares in petrochemicals, any extra mpg, however it’s derived, can only be a bonus. 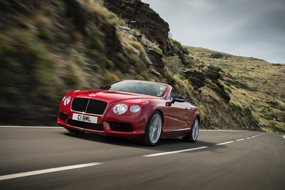 So then, what of the associated costs of the GT V8 S? Well, even before you’ve perused the option list, prices start at £152,900. Add extra luxuries and you’re soon looking at the kind of prices that would bag a nice little two-up-two-down in the provinces. Nevertheless, no other bespoke-built, four-seater, leather-lined, 191mph convertible I can think of is quite so capable of making you look like a million dollars. One Comment on "Bentley Continental GT V8 S – Review"
The updated design is amazing, I think they have modernised the design perfectly. I remember hiring the 07 for my sisters wedding and I really couldn’t fault the car, so I would love to see how they have improved this new one!